On my recent trip to Taiwan and Tokyo, the cute factor was inescapable. Buildings, restaurants, museums, you name it. Everything has a mascot. Everything has an animated character. 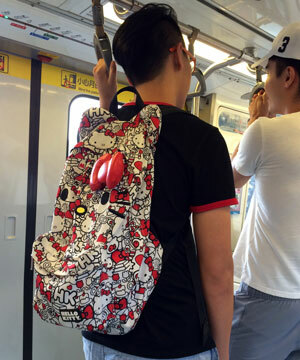 And the queen herself, Hello Kitty, continues to reign supreme. 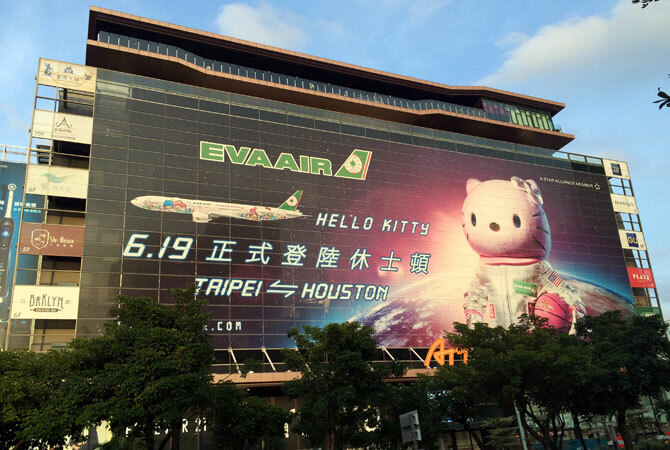 Our trip coincided with the debut of the new EVA Air Hello Kitty route to Houston. The subway and street ads feature Kitty as an astronaut, which makes sense. Why she carries a basketball, I couldn’t say. Maybe the Taiwanese are crazy about the Houston Rockets? These themed routes have special planes decked out in Hello Kitty from tip to tail. It has to be seen to be believed. The depth and detail is truly astonishing — in addition to the plane wraps, there are more than 100 Hello Kitty branded items inside the plane, from the lavatory soap to the food to the toilet paper. EVA Air has even redesigned its airport counters and kiosks to promote the collaboration. It’s like a a giant Sanrio store. I can’t even wrap my head around the amount of work and money this must have taken to build out. The licensing and contracts alone, much less the design, printing, and manufacturing costs to duplicate everything on a plane… amazing. They report it’s expensive, but profitable. That is what you call brand equity.